Ethyl or Isopropyl: Which cleans better? Home \ Ethyl or Isopropyl: Which cleans better? There is one issue about rubbing alcohol that many people are asking – what is better, ethyl or isopropyl?. And technically speaking, NEITHER one of them is better, because they are BOTH cleansers, disinfectants and antiseptics. The only difference is that isopropyl comes from crude oil, while, ethyl comes from sugar cane. Hospitals prefer using isopropyl on their procedures, while homes, particularly moms, prefer ethyl, however both alcohols have the same effect in sanitation. In short, it is a matter of buyer’s preference, but both Doctor J Isoporpyl and Doctor J Ethyl Alcohol clean the same way, plus smell better than any alcohol in the market. 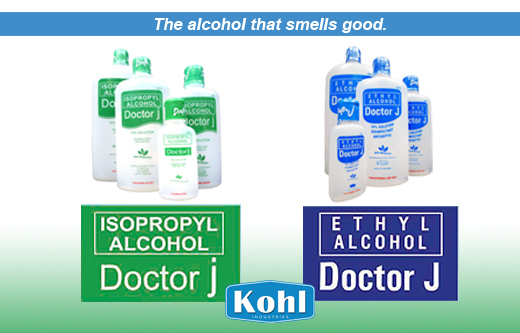 Doctor J offers two sets for both isopropyl and ethyl, in 40% and 70% concentration of alcohol.